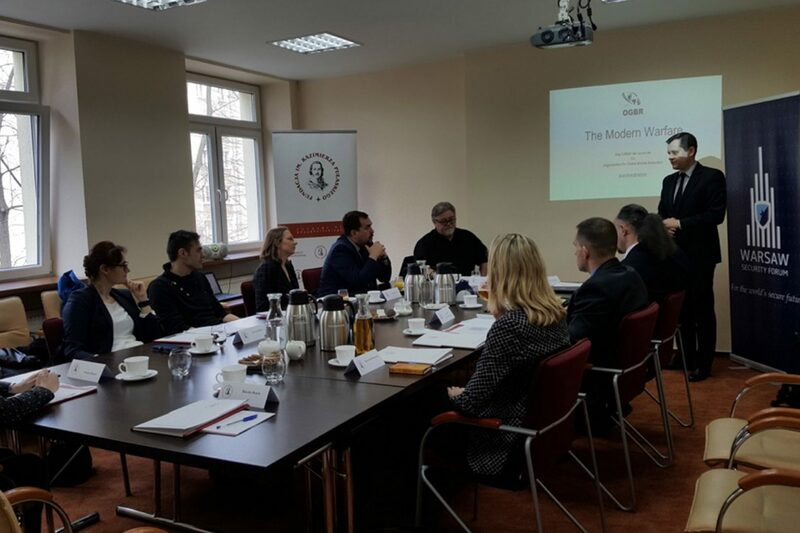 On March 31st Pulaski Foundation organized a seminar concerning potential threats from foreign fighters and terrorist organizations with Guy Collyerthe, head of the INTERPOL BioTerrorism Prevention Unit. In his presentation Guy Collyer discussed threats arising from engagement of European volunteers in ISIS units and presented studies conducted in Great Britain about factors that determine why previously indoctrinated people decide to organize attacks, most often suicidal. A significant danger coming from terrorists’ determination to obtain weapon of mass destruction. So far the security debate concerned mainly around chemicals weapons, in some way leaving out the usage of biological weapon. During the discussion there were questions touching on effectiveness of international cooperation. According to the expert the main problem is the lack of appropriate exchange of information which disenables engaging in efficient preventive actions. Currently, a significant number of officials act within their competencies but they do not cooperate with partners from other countries. Guy Collyer has had a longtime career in Policing, was the head of the INTERPOL BioTerrorism Prevention Unit and is the founder of the Organization for Global Biorisk Reduction, a nongovernmental organization.